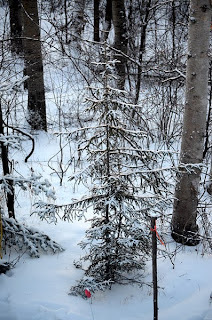 You might walk past this young fir tree with the spines of its branches mounded with fine powdery snow. And then, suddenly, if you step back to look again, the whole tree comes a festive structure of stripes in light and dark. This is the entire fir tree, it looks rather unremarkable in its setting at the corner of the driveway, dwarfed by more substantial trees. And closeup, what an impressive sight! Do you have a full tree shot for tomorrow maybe? 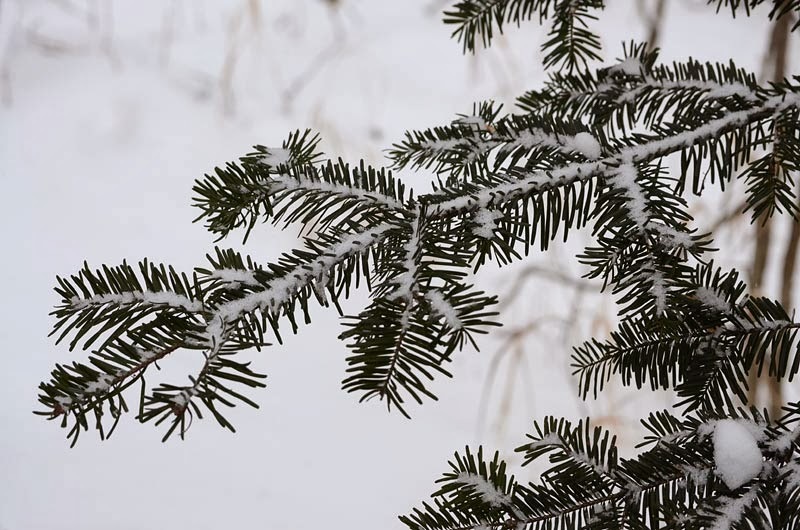 We had an unexpected touch of snow overnight and this morning the fir trees were dusted like so here, too. The lawns and drives were crisply white, even the lone pair of tire lines stayed white. And it was nearly sunny, so it seemed quite blinding when I opened the curtains. So exciting this four season climatology. Always up for a challenge, I took a full shot of this same fir tree this morning, driveway markers and all. How good that you are experiencing the brilliance of winter snow for yourself! I'm always impressed that changes in the light really change how everything looks. Such a sweet baby tree! Personally I may prefer southern California lighting this weathery northern stuff. sigh.